Thanks to some fortuitous circumstances, issue #8 will hit shelves tomorrow (8/15/18), significantly earlier in the month than the book’s usual release dates! Written by Ian Flynn and illustrated by Evan Stanley, the last book before the beginning of the epic Battle for Angel Island arc will introduce a brand new character, Whisper the Wolf! Designed by Stanley, both the A & B covers will be by her. 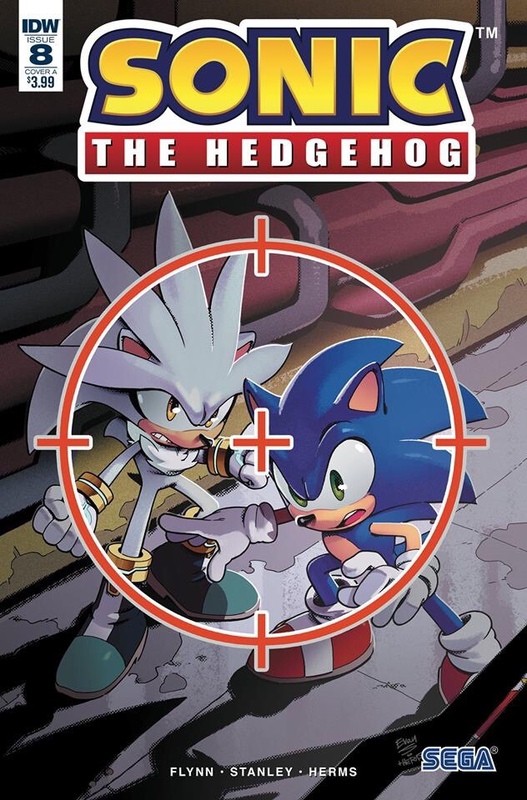 They create a beautiful mirror image, one with Sonic and Silver in Whisper’s cross-hairs, and the other displaying Sonic reflected in the lens of her signature mask! Per usual, the RI cover will be done by Nathalie Fourdraine, continuing her streak. This also confirms that although cited in the early solicitations, Gigi Dutreix will not be doing a cover for issue #8, at least.